From his first venture into Karting through to competing in the Olympics, Mario has been spending plenty of time taking part in activities other than Princess saving. In 2007 (European release) Mario and his mates tried their hands at shooting a few hoops on Nintendo DS in Mario Slam Basketball (aka Mario Hoops 3-on-3 in the US) and now it's available to download for the Wii U Virtual Console. This being a Nintendo sports game it's not exactly a simulation, but rather a colourful outing filled with special moves, cartoony graphics and - of course - touchscreen controls. There's a decent amount of game modes, including unlockable time trial 'Dribble Race' and 'Tourneys' to compete in for cups. Pleasingly this works well on Wii U, particularly when using a GamePad and TV combo - the controls are thoughtful and soon become second nature after a bit of practice. A warning though for left-handed folk - you'll be relegated to using the GamePad face buttons instead of the analogue stick to control character movement. 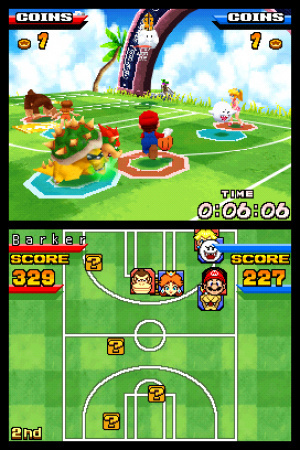 Teams are made up of three players per side selected from the usual bunch of Mario stalwarts, each with their own special move and stats. Interestingly, as well as featuring Mario and his entourage you can unlock various secret characters from developer Square Enix's Final Fantasy series, including everyone's favourites Moogle and Cactuar. As in real life Basketball, points are scored for netting your ball into the basket depending on the distance you take the shot from - however, you also receive bonus points for particular shot types and even more points for the amount of coins you hold when scoring. 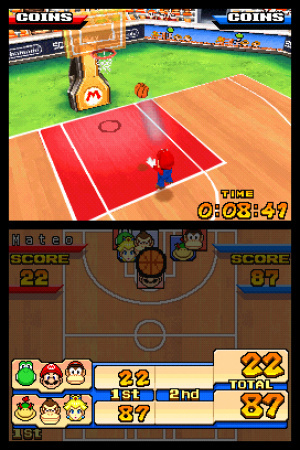 Coins can be gathered up by dribbling over question-mark spaces that randomly appear during play or by sinking a charged-up slam dunk for bonus coins. Unfortunately coins can also be lost if your character is hit by an item or by a player. As coins are worth 1 point each and you can hold up to 100, it's quite common for games to swing rapidly in favour of one team to another, especially if you hold off from scoring and go on a coin collecting spree. 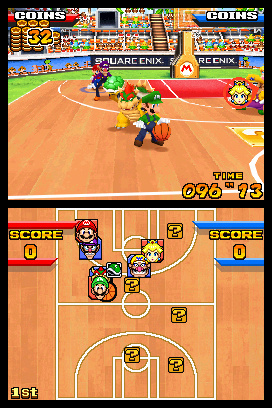 A defensive player (not in command of the ball) can pick up items instead of coins from the question mark panels on the floor, served randomly ala Mario Kart. These items include delights such as green shells for throwing, exploding bombs and speed boost mushrooms, all of which help turn the tide of a game in your favour and spice up the proceedings. Additionally there's a good variety of different courts to play on, the list reading very much like a Mario Kart game – Mario Stadium, Koopa Beach, Bowser's Castle, DK Cruiser and so on. Each court comes with its own set of quirks such as DK barrels flattening players, exploding fireballs and even a court that's played entirely underwater. The single player mode takes you through all the stages, separated into tournaments of increasing difficulty and culminating with the Rainbow Tourney. The biggest downer with the Wii U version is simple; you can't enjoy multiplayer. The original DS version supported multiplayer over DS Wireless Play, but in the Wii U port it's simply not possible. This would be sort of OK if the single player was brilliant, but it seems the AI difficulty can rapidly spike in an upwards curve as you move through the cups. Once this happens, Mario Slam Basketball is brutal and it's easy to become frustrated as the AI ramps up and begins blocking all your slam-dunk attempts and using countermoves consistently. The good news is it's manageable for those willing to put in the time to master the control system, but it will turn off the casual player rapidly. The additional single player modes and time trials won't last long either; the main 'Tourney' mode can be blasted through in a few sittings, so the solo fun is short lived. Finally, we have to give credit where credit is due - graphically this is a gorgeous looking game, especially when you consider that it's a Nintendo DS title. The graphics are colourful, characters are large and well defined and the framerate is super smooth. There's beautiful presentation throughout and a fantastic, albeit a little samey, soundtrack. It's top-notch stuff and taken in its correct context (i.e. this is a Nintendo DS game) then it's easy to appreciate the effort Square Enix put into matching Nintendo for programming prowess. 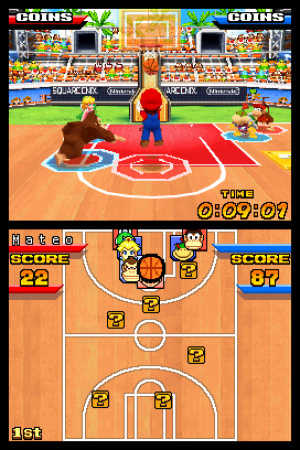 Mario Slam Basketball was a great handheld title in its day (especially when played with a friend) but here on Wii U the multiplayer option is sorely missed and brings our final score down. That said, if you're after a fun, colourful and (at times) manic sporting experience with inventive controls and wonderful presentation, this is definitely worth a 'shot'. Yeah, it's a huge shame that they can't be bothered to emulate multiplayer functions for DS VC. This game suffers greatly for it. I played the hell out of the original version's multiplayer. This is a unique, competitive, polished game, a small, tight package that works absolutely perfectly, and it's one of my many favorite games on the DS, and the original DS one is straight up 10/10 for me, it's flawless. @RikuKH It's not 10/10 on the Wii U. No multiplaayer which was one of its biggest features. And loses even more marks for me as I'm a southpaw. @Shugo real DS or 3ds or 2ds, they all do DS download play. Which would make it even easier for multi child families to have the resources to play four player when offered. Or more than four player, like Mario kart DS, metroid prime hunters, or star fox command. I think I'll seek out the original DS version. Sounds like a cool game to me. 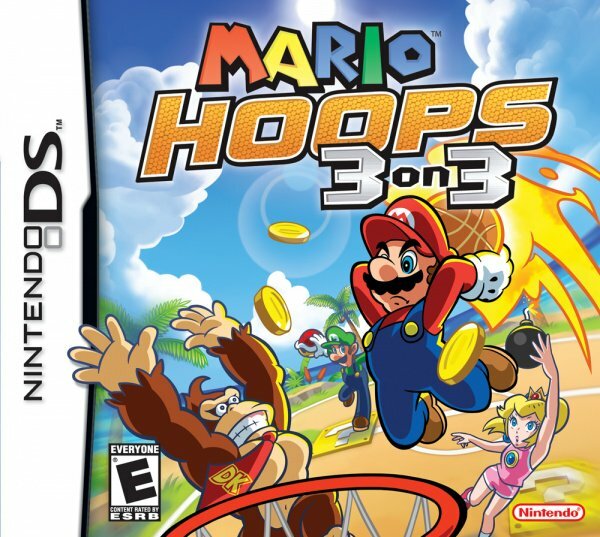 One of my first and favorite Mario Sport games, it was a challenge being left handed but around the time hoops 3 on 3 was released I was an expert at using my right thumb at that point, also the buttons help out pretty well too. I'm also not ashamed to admit that due to its difficulty when I was young hoops was the first game I used action replay on, just for cactuar tho, the rest of the unlockables I did actually unlock. Man I loved this game. Why is everyone - including the reviewer - criticising the lack of multiplayer, as if it is a major part of the game? Anyone who actually played the DS original knows the multiplayer was not worth your time - it was minigames, not actually full matches. Are you all just jumping on the bandwagon? I refuse to buy games where the multiplayer is missing. @C-Olimar Personally, it's because I'm actively looking for games to play with friends/family. I know they could implement it if they wanted to, but they aren't, which comes across as lazy. All these Wii U DS are making me want to go buy the actual DS games and play them on my 3DS! Lol for the coin slam dunk. Nice to see unusual basketball game here because not many developer can develop out of the box games. Better played on 3DS for real portable means. @C-Olimar thanks. Now knowing the multiplayer was mini games and not the actual game, I won't bother looking for a DS version and will contemplate this. 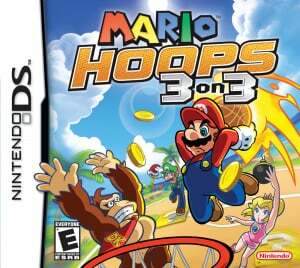 I would love a multi player Wii U version ala NBA Jam and Tiny Toons 3 on 3 basketball (although all the sports in that were fun). My question is when they release these titles, especially the DS ones that feature multiplayer, is there no way to have it log into the new Nintendo servers? Knowing a game has stellar multiplayer, then it gets released without it does make me want to bother with it one bit. @C-Olimar Hold on - hold on - hold on - hold on... I remembered if you had multiple cards you could play regular matches.... I had played MP only using single card, and I was looking forward to finally try multi-card play... which doesn't exist... that's shocking and disappointing..
@Moon If you're looking for fun multiplayer, this isn't the game. @RikuKH Cheers buddy - I looked it up and you're right, you can play exhibition matches with multiple cards. It was the lack of online multiplayer that must've annoyed me as a kid - no-one I knew had the game card so I was stuck with the limited download play. @C-Olimar Oh come on. Now that's confusing, I looked it up when you said it didn't have a proper multiplayer and I got the same info. But WHAT a relief, I just tried it myself (a copy of the game + R4 + 2 DS'), and yes, you can play regular matches, and yes, the game is still pure awesomeness. Kind of a weird comparison, but it feels kind of like when you've saved up money like a year ago, and you know you're safe if your bank account runs out, and then you suddenly can't find that extra money - and then you do, at that moment, it feels even better to have it ....heh.